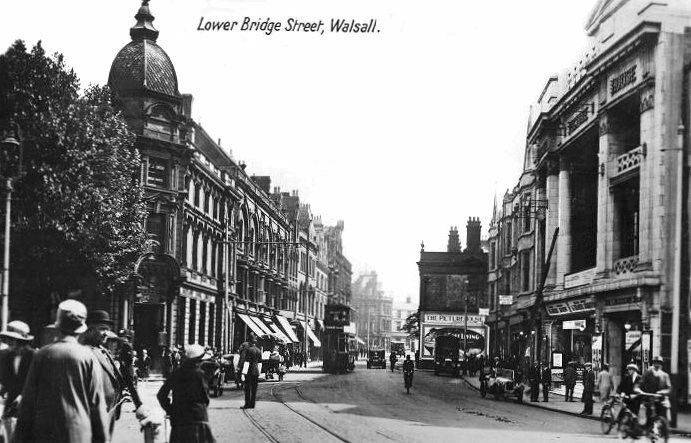 By 1851 Walsall's population had more than doubled since the beginning of the century, rising from 10,399 in 1801 to 26,816 in 1851. This was typical of most of the towns in the Black Country because large numbers of people moved into the area seeking employment in the many local industries. Inevitably this led to overcrowding, poor living conditions, and poor sanitation. All of which had to be dealt with in the fullness of time. Frederick Willmore describes an interesting incident in his 'History of Walsall' which took place in the winter of 1843. The 'Albion' coach was transporting a gang of convicts through Walsall on their way to Portland prison. As the coach made its way along Bloxwich Road, the horses took fright near Pratt's Bridge and dashed at full speed into the centre of the town. In Park Street the coach collided with the carriage belonging to Mr. Perks, the sheriff's officer. It overturned and killed the coachman, and Mr. Illidge, Deputy Governor of Chester Gaol. In the confusion that followed, the convicts were supplied with files by some friendly people in the crowd. They continued their journey, and on the way managed to liberate themselves. At Dunsmore Heath they overpowered their guards, set the horses free, and fled. Although most were recaptured, two were never found. The incident led to other, and safer means of transporting criminals from one place to another. Upper Rushall Street and St. Matthew's Church steps. From the 1899 Walsall Red Book. The Mechanics’ Institute opened in 1839 in Freer Street with around 100 members, under the presidency of Richard James, who is listed in White’s Staffordshire Directory of 1851 as a merchant and factor, with a business in Bridgeman Place. The institute was founded to improve the mechanical skill, and the moral character of the working classes, and consisted of a library and a reading room. The annual subscription was ten shillings. Sadly it had a short life, after becoming embroiled in local politics, even though it was a non-political and non-sectarian organisation. The institute was openly supported by radical Walsall Liberal M.P. Francis Finch of The Hollies, Great Barr, a banker with a business in Bridge Street. The institute’s secretary was Joseph Hicken who became secretary of the Political Union for Walsall in 1830, and secretary to the Anti-Corn Law League in 1838. The Corn Laws, introduced in 1815 were hated by many because they only benefitted landowners, and caused a great increase in the price of corn. The local Tories, who supported the Corn Laws, were determined to destroy the institute, and refused to allow their employees to become members. After two years the membership had fallen to 35, and after incurring a considerable amount of debt, the institute closed in November 1841. The Bridge. From W. Henry Robinson's Guide to Walsall, 1889. 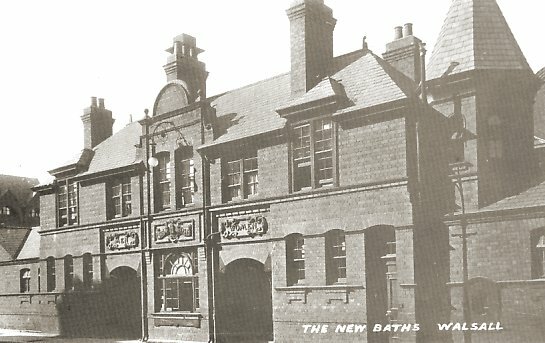 Walsall’s first public baths, the Vicarage Water Baths in Dudley Street, opened in 1850, and stood on the site of St. Matthew’s Quarter Car Park, opposite Bath Street, which was named after the baths. The baths were established by Thomas Gameson, with water from the natural springs known as ‘The Spouts’. The building contained a swimming bath, a shower, and several slipper baths. It opened on week days from six o’clock in the morning until nine o’clock in the evening, and on Saturdays from six o’clock in the morning until ten o’clock at night. There was an unsupervised department for men, and a ladies department with a female attendant. The water was steam heated and kept at a suitable temperature. In 1856 the proprietor was D. Rapp. First class for a single hot bath 10d. First class for a shower or swimming bath 6d. First class for children 4d. Second class for a single hot bath 8d. Second class for a shower or swimming bath 4d. Second class for children 3d. In the middle years of the nineteenth century when few houses had access to running water, washing and personal hygiene was often neglected. Public baths played an important role because for many they were the only place where it was possible to have a proper wash. Elias Crapper's baths in Littleton Street which opened in the 1860s, and survived for around 30 years, was very popular and often extremely crowded. In 1896 the Corporation opened the Central Baths in Tower Street. The building was designed by Walsall architects Bailey & McConnal, and included a swimming baths, slipper baths, medicated baths, and Turkish baths. It survived until 1959 when it was demolished to make way for the Gala Baths which opened on 6th May, 1961. 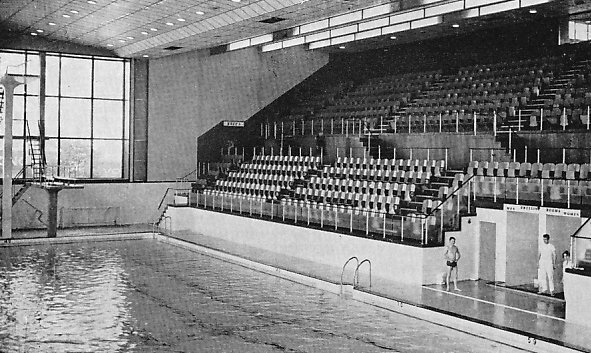 The new baths were built at a cost of £380,000 and include a competition pool 110 feet long and 45 feet wide, with seating for 800 spectators, a brine pool and training pool 75 feet long and 30 feet wide. The Central Baths in Tower Street. From an old postcard. The Gala Baths in the early 1970s. In 1922 the Corporation built an open-air swimming pool, 75 feet long, and 36 feet wide in Field Close, Bloxwich. Slipper baths were added in 1923, and in 1932 a building with an overall roof was built around the pool. There was a remedial bath service, and a covering for the pool, so that in winter months the building could be used for dances, plays, boxing matches, wrestling, receptions, and parties etc. Walsall like most of the surrounding towns had its fair share of slums. In 1852 and 1853 the old overcrowded slum properties on Church Hill were demolished under the terms of the 1824 Improvement Act which gave the Corporation powers to pave, light, clean, and widen the streets, and to improve the town. 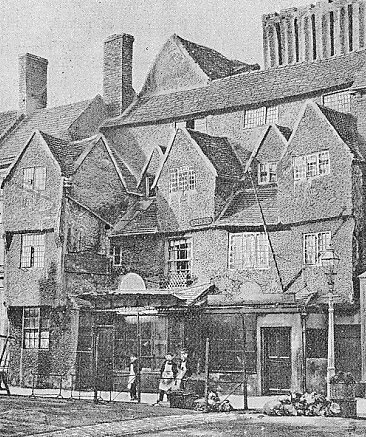 The old Free School and the Market House built in 1809 were also demolished and the area around the church was opened out. Large scale demolition of the town’s many slums became possible after the passing of the 1875 Artisans’ and Labourers' Dwellings Improvement Act passed by Benjamin Disraeli's Government. The terms of the Act gave local authorities the powers to buy slum areas, and replace them with decent housing. The Act compelled owners of slum dwellings to sell them to the local authority, who had to provide compensation. The dwelling would then be demolished, and replaced with decent housing. Demolition began in an area of 9,000 square yards at Town End Bank, and parts of Station Street, Wolverhampton Street, Green Lane, and Marsh Lane, which contained some of the most squalid slum properties in the town. The district was insanitary, and unhealthy, and some of the residents were described as idle, profligate, with associations that are disgusting to public morality, and common decency. The compulsory purchase of the land cost £17,750. Town End Bank before demolition. From the 1899 Walsall Red Book. 2. John Twist 16. Samuel Mason 30. Jas. H.
13. Widow Lander 27. J. Athersmith jnr. There are many buildings in the town which are old and dilapidated and totally unfit for human habitation. In many cases these ruinous tenements are so close together as to constitute an obstacle to proper ventilation; and the only remedy is to clear the ground and let fresh air in.... The houses however, are in a dilapidated condition and are quite unfit for the purpose to which they are devoted. The floors are rotten and full of crevices affording shelter to vermin and dirt.... In the kitchen of one of them, in which there were a number of people and in which cooking had to be done, I found a corpse, and this is not the first time such an occurrence has come to my notice. I would recommend the establishment of a public mortuary to which the person dying in lodging houses or other crowded dwellings might be removed to await internment. Old buildings in Digbeth. From W. Henry Robinson's Guide to Walsall, 1889. Smaller slum areas were cleared under the terms of the 1875 Public Health Act which was designed to combat filthy living conditions, that could lead to the spread of diseases such as cholera and typhus. The areas cleared included courts and alleys in Bull’s Head yard, Church Hill, The Ditch, Dudley Street, Peal Street, and Lower and Upper Rushall Street. Although some of the worst slums had been removed, many more remained. Overcrowding and insanitary living conditions were not uncommon, particularly in the poorer areas, where there was still a lack of sewers, a lack of proper drainage, and an insufficient fresh water supply. There would be no large scale redevelopment until after the First World War when the 1919 Housing Act came into force. This actively encouraged local authorities to build new houses, and provided financial incentives. In the 1880s articles appeared in local newspapers describing the terrible living conditions endured by many of the poorer families. In January 1888 the Walsall Free Press and South Staffordshire Advertiser included an article describing the wretched conditions amongst the poor in the Wisemore district. It gave an insight into the poor housing conditions in the area, and the suffering endured by many. In 1885 to 1887 there was a serious trade depression which affected the whole of the Black Country and led to high levels of unemployment. The winter of 1885 to 1886 was extremely cold and severe, and greatly added to the suffering of the poor. 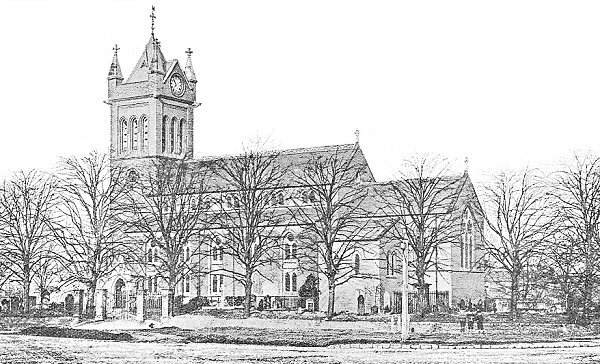 A soup kitchen was established at St. George's Road Church Schools which opened on 13th February 1886, and operated until late March when the snow had disappeared. Each day thirty gallons of soup, and a small supply of tobacco was available for adults, and whenever possible, dinners of soup and jam pudding were given to children. By means of the Soup Kitchen established at St. George's Road Church Schools, and worked by the Vicar and his Committee, a large amount of help has been given to the suffering poor. The first distribution was on the 13th of February, and up to Saturday last there had been twelve distributions, each of thirty gallons making a total of 360 gallons. In addition dinners of soup and jam pudding were given to children on six occurrences, the number of little ones thus being provided for being 792. Adults dinners had been given three times and the number provided for was 405. To the men present on these occasions a small supply of tobacco had been given out. In addition to this dinners had been served in other school rooms. The snow had now disappeared but it was still found that there were very many in great distress receiving no Saturday wage. It was decided to continue the children's dinners if the necessary funds were supplied. Although the situation improved in the late 1880s, things went from bad to worse in the 1890s when a severe trade depression throughout the country resulted in a large number of unemployed people. The depression started in 1893 and lasted for two years, during which time the government set up a Select Committee to investigate the extent of distress caused by the lack of employment. Walsall Corporation responded by giving employment to as many people as possible who could assist in sweeping the streets, and clearing away snow etc. Sadly this proved to be totally inadequate, and so the Mayor, J. Noake convened a meeting of the inhabitants and started a relief fund, based on voluntary subscriptions. The sum of five hundred and sixty pounds was raised, and tickets were issued to people requiring relief. The maximum allowed to a single family was 10s.6d per week. Loaves of bread, and grocery tickets were also handed out. In 1893 the Medical Officer of Health wrote a report on public health in the town. At the time there was a high death rate of 24.42 per 1,000 of the population, and the deep trade recession led to many tradesmen being unable to properly support their family. The rise of poverty, leading to poor living conditions greatly helped the spread of diseases such as smallpox, scarlatina, diarrhoea, and typhoid. The report concluded that overcrowding was still a serious problem which could not be remedied until the return to full employment. 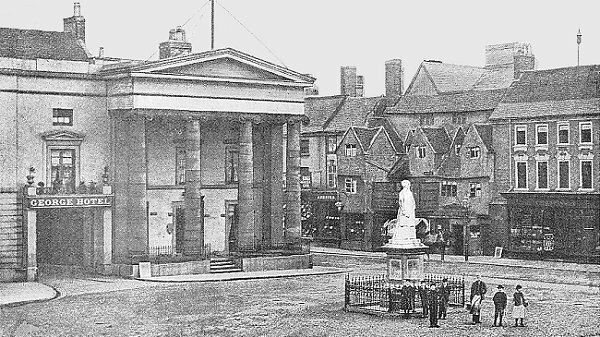 Walsall’s first newspaper, the weekly Walsall Courier and South Staffordshire Gazette appeared in 1855, with an office in New Street. It appears to have been short-lived, but was soon followed by the Walsall Miscellany. In 1856 the Walsall Free Press and South Staffordshire Advertiser came into existence. It ran until 1903 when it was taken over by the Walsall Observer. Other newspapers appeared around the same time including the Walsall Herald, the Walsall Guardian and District Advertiser, the Walsall Standard, and the Walsall News, which became the Walsall Observer. 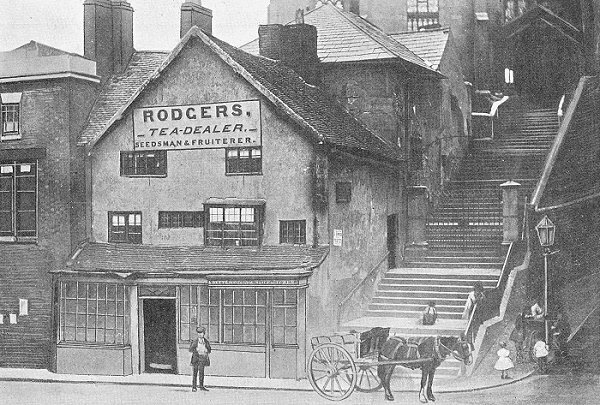 In 1857 Mr. Robinson issued the Walsall Advertiser. In January 1861 Walsall printer W. H. Tomkins produced the weekly Walsall Herald, which survived for 12 months, and in 1868 John and William Griffin founded the weekly Walsall Observer and South Staffordshire Chronicle which became the town’s most successful newspaper. One hundred years later it was the town’s only surviving newspaper. Unfortunately in the early years of the twenty first century its fortunes wavered, the number of staff was greatly reduced, and in 2009 its owners, Trinity Mirror, decided to end publication. Park Street. From an old postcard. The Poor Law Amendment Act of 1834 led to the formation of Poor Law Unions, each with a central workhouse. The unions were administered locally by Poor Law Guardians who were elected by the local ratepayers, and inspected by the Poor Law Commission, later called the Poor Law Board. The Walsall Poor Law Union was formed in 1836 and operated across an area of 31 square miles, which included the whole of Walsall, Aldridge, Bentley, Darlaston, Great Barr, Pelsall, and Rushall. The Central Union Workhouse was built in Pleck Road at a cost of £7,600. It opened in 1838, and could accommodate 350 people. The workhouse was enlarged in 1881 to cater for 464 people, and in 1896 a separate 130 bed infirmary was added. In 1867 Dr. J. H. Stallard produced a damning report for the Lancet on the conditions in Walsall Central Union Workhouse. It was published on 9th November, and was not only critical of the workhouse itself, but also of past inspections which had given it a clean bill of health. One of Walsall’s most famous sons, Jerome Klapka Jerome was born in Bradford Street on 2nd May, 1859. He was a journalist and writer who is best remembered for his novel ‘Three Men in a Boat’. Jerome’s father the Rev. Jerome Clapp, renamed himself Jerome Clapp Jerome. He came to Walsall from Appledore, near Bideford where he had been minister of the Congregational church. In Walsall he was an ironmonger, and a deacon at Bridge Street Congregational Church. He later conducted services when the congregation moved to the assembly room in Goodall Street, and designed their new church in Wednesbury Road. Jerome was the fourth child of Jerome and Marguerite Clapp. He had two sisters, Paulina and Blandina, and one brother, Milton, who died at an early age. It was a poor family, mainly because of his father’s bad investments. He attended St Marylebone Grammar School in the City of Westminster, but had to leave his studies to find work after loosing his father at the age of 13, and his mother two years later. He initially worked for the London & North Western Railway, collecting coal that fell from the trains, and then unsuccessfully tried his hand at acting. After a number of jobs, he wrote a comic memoir about his time in the theatre, which met with some success. In 1888 he married Georgina Elizabeth Henrietta Stanley Marris, and along with Elsie, her daughter from a previous marriage, they honeymooned on a little boat on the River Thames. When they returned home Jerome immediately began to write Three Men in a Boat, which was published in 1889, and became an instant success. Although he wrote many other novels, essays, and plays, he could never recapture that success again. In the First World War he served as an ambulance driver in the French Army after being rejected by the British on account of his age. Sadly his stepdaughter died in 1921, and in 1926 he wrote his autobiography ‘My Life and Times’. On 17th February, 1927 shortly before his death, he was presented with the Freedom of the Borough of Walsall. In June he suffered a terrible stroke, and died two weeks later in Northampton General Hospital. His ashes are buried at St. Mary's Church, Ewelme, Oxfordshire where he had a farmhouse. Elsie, Ettie, and Blandina are buried beside him. Belsize House, on the corner of Bradford Street, and Cross Street where he was born, carries a blue plaque. His initial K is short for Klapka, named after an Hungarian refugee who stayed with the family for a time, and became his father’s friend. By the 1850s St. Matthew's graveyard was full, and St. Peter’s was waterlogged, so urgent action had to be taken. The Burial Acts of the 1850s gave local authorities the power to establish municipal cemeteries, and so the local authority acquired around 13 acres of land in Queen Street, and in 1857 opened Queen Street Cemetery, the first municipal cemetery in the town. It closed in 1969 and is now remembered as the last resting place of Sister Dora. It is now managed by Lifelong and Community Services. In 1873 the council acquired six acres of land off Field Road in Bloxwich and opened a cemetery there. It has since grown, and now covers over sixteen acres. In 1894 the council opened another cemetery at Ryecroft which had separate mortuary chapels for Anglicans, Roman Catholics, and Nonconformists. A Crematorium opened on the site in October 1955. It closed in 1984 and was replaced by Streetly Crematorium. The Guildhall. From an old postcard. G. B. Nichols who had previously worked on The Beeches Estate in West Bromwich, and designed Walsall’s Free Library in Goodall Street. The laying of the foundation stone took place on 24th July, 1865. The builder was Mr. Burkitt. The building was completed in December 1866, in time for the inaugural banquet on 1st January, 1867. It had cost £5,308. The building, which is Grade II* Listed has been extensively renovated. 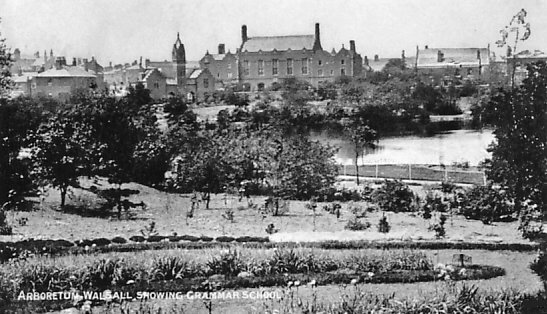 Walsall’s grandest park, the Arboretum, was set up by the Walsall Arboretum and Lake Company, founded in 1870 to turn the area of flooded limestone pits into an arboretum, public, and pleasure grounds. The company had a starting capital of £4,000, and in March 1873 took a 99 year lease from the landowner Lord Hatherton for the lake above the flooded mine workings, and seven acres of adjacent land. The plan was to build an arboretum and gardens with facilities for amusements such as boating, fishing, archery, and croquet etc. There would be a lodge, a boat house, a bandstand, toilets, and an ornamental garden through which visitors could walk. The Arboretum. From an old postcard. The grand opening ceremony took place on 4th May 1874, when the park was officially opened by Lady Hatherton in front of 4,000 people. Unfortunately the venture was not a commercial success, and the company went into liquidation in 1877. Although Lord Hatherton and a group of local businessmen took over after the company’s demise, the venture was still unsuccessful. Due to public demand the Council agreed to take it over as a public park, and in 1884 purchased the freehold for £4,000. It officially reopened on 21st July, 1884. In 1890 the council acquired another 13 acres from Lord Hatherton to extend the park, which were opened to the public in 1892.
the number of persons to be admitted by such ticket must not be more than 8. £1.1s.0d. 2. Annual Family Ticket to admit not more than 5 persons, including servant on the above conditions.. 15s.0d. 3. Annual Season Ticket to admit 2. 10s.6d. 4. Annual Single Ticket. 7s.6d. 5. Single Admission on all days in the week, but one special day. 2d. 6. Children under 10 years of age, accompanied by an adult. 1d. 7. 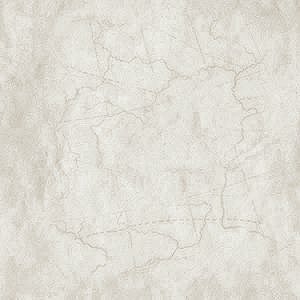 Special days, the prices charged to be at the discretion of the Directors. When required, Family Tickets will be issued to include more persons than those above specified on payment of 2s. for each person. The Annual Tickets will date from 1st of May. In the nineteenth century a large number of societies and institutions were formed to bring like-minded groups of people together, with a common interest such as art, literature, music, or science, and hopefully improve the intellectual life of the town. One of the earliest was the Walsall Literary Society, founded in 1836. Another, the Walsall Literary Institute, founded in 1884 was one of the most successful, with a large number of members. It replaced an earlier, but short-lived literary institute that was formed in 1876 and met weekly at the Borough Club in Freer Street. The Institute met in the Temperance Hall in Freer Street, and provided lectures and talks given by experts in such things as art, literature, music, or science, and also organised social gatherings. There was also a comfortably furnished reading room in Bridge Street, supplied with the best periodicals and magazines. In 1891 it moved to Lichfield Street. The Institute, which survived until 1910, also gave grants to the Temperance Hall, and to the Science and Art Institute. The principal musical society in the town was the Walsall Philharmonic Union, established in 1863. It had around 200 members and gave concerts in conjunction with the Literary Institute at the Temperance Hall. Rehearsals were held on Monday evenings, under the control of the conductor, Dr. C. Swinnerton. In 1880 the society merged with the Walsall Choral Union. Another musical society that met at the Temperance Hall was the Walsall Orchestral Union, formed in 1884. Meetings were held on Tuesday evenings in the committee room. All Saints' Church, Bloxwich. From W. Henry Robinson's Guide to Walsall, 1889. Another society that promoted art, literature, music, and science was the Institute Society, formed in 1883. Meetings were held at the Science and Art Institute, and present and past students were encouraged to join. The society met on the second and fourth Thursday in each month to listen to a lecture, or a paper given by one of the members, followed by a discussion on the topic. Horticulture was not forgotten. The Florist Society formed in 1879 attempted to encourage the growth and cultivation of flowers, fruit, and vegetables amongst the working classes. It held an annual exhibition in St. George’s Hall that attracted a lot of entries. 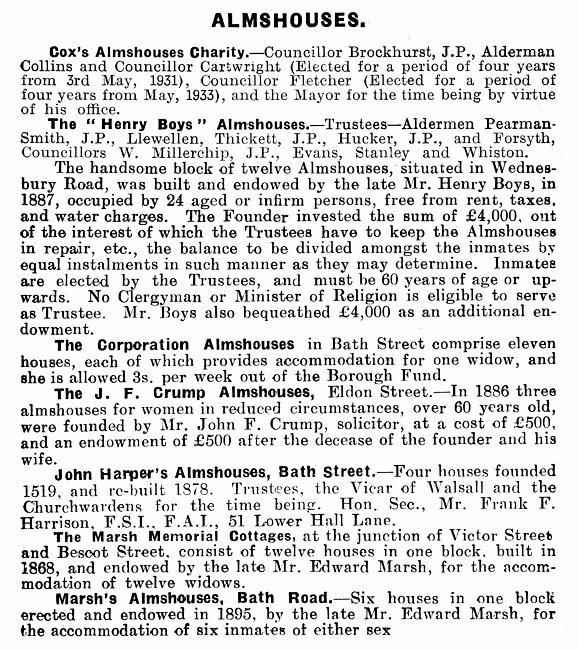 In 1888 there were 681 entries, and £41.18s.6d. in prize money. 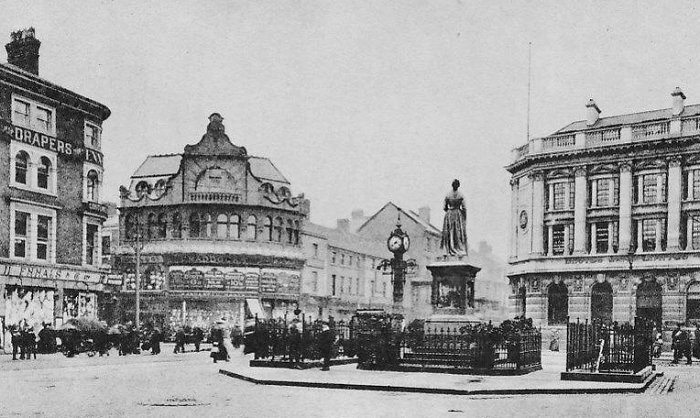 The Walsall Chamber of Commerce held its first meeting on 2nd September, 1881. It has done much for the trade of the town, and in its early years used its influence to improve the postal service, to oppose increases in railway rates, and to promote parliamentary schemes that benefitted local industry. In the 1880s it was managed by a president and council consisting of sixteen elected members. Early examples of further education classes were the mutual improvement classes run by groups such as the Bridge Street Mutual Improvement Society, formed around 1860 to run classes in the schoolroom of Bridge Street Congregational Chapel, the Walsall Wesleyan Mutual Improvement Society, the Walsall Church of England Institute, and the Butts Working Men's Institute. There was also the Ablewell Street Science Institution which used the schoolroom in Ablewell Street Wesleyan Methodist Chapel. Technical education began in 1854 with the formation of the Walsall School of Design and Ornamental Art, founded by local sculptor, W. Smith. 1869 saw the formation of a Government School of Art in Bridgeman Place, which in 1871 moved to rooms in Railway Chambers, Station Street. 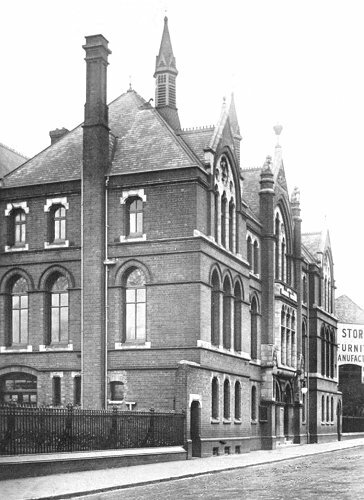 In October 1872 the school merged with the Ablewell Street Science Institution to form the Walsall Science and Art Institute, with Sir Charles Forster, M.P., as President. The Science and Art Institute. From W. Henry Robinson's Guide to Walsall, 1889. The Science and Art Institute. From an old postcard. The institute struggled for some years with insufficient funds, but help was at hand in 1887 thanks to an unconnected gesture by the Prince of Wales, who championed the building of a grand institute in London, to be known as the Imperial Institute. Walsall’s Mayor, William Kirkpatrick, wanted to emulate the Prince’s example by building a grand institute in Walsall to commemorate Queen Victoria's golden jubilee. He knew about the plight of the Science and Art Institute, and suggested that a suitable building should be erected in the town to house the institute. Land in Bradford Place was given by Lord Bradford, and the foundation stone was laid on Jubilee Day, 20th June, 1887 by the Mayor. The attractive and nicely balanced building was designed by Dunn and Hipkins, of Birmingham, and cost around £6,000. The opening ceremony, on 24th September, 1888 was performed by local M.P. Sir Charles Forster, ably assisted by the Chairman of the Building Committee, Alderman Holden, J.P.
A technical day school for boys was opened at the institute in1891. It had 52 pupils. 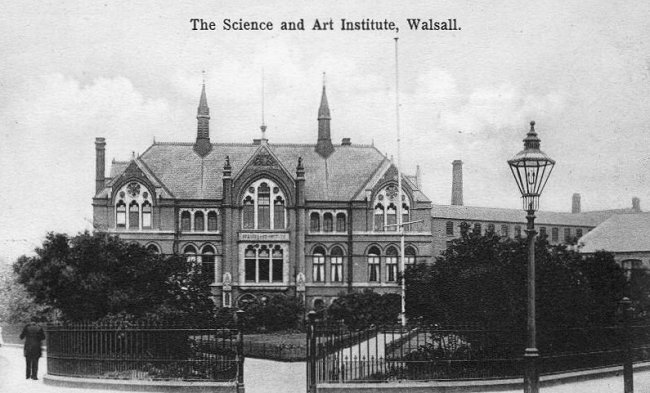 On 31st August, 1897 the institute was transferred to Walsall Council and became the Walsall Municipal Science & Art Institute. Eleven years later it moved to Goodall Street, and in 1926 became Walsall Technical College. 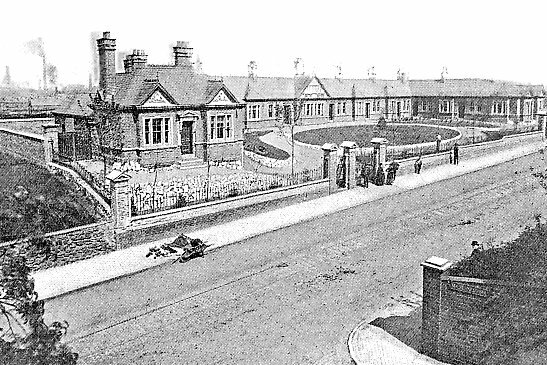 The Henry Boys Almshouses in Wednesbury Road were officially opened on 19th June, 1887. They were built at a cost of £10,000 and designed by Mr. F. E. F. Bailey of Walsall. They were generously bequeathed by Mr. Henry Boys. The 12 almshouses were Grade II Listed in 2005. Henry Boys Almshouses. W. Henry Robinson's Guide to Walsall, 1889. 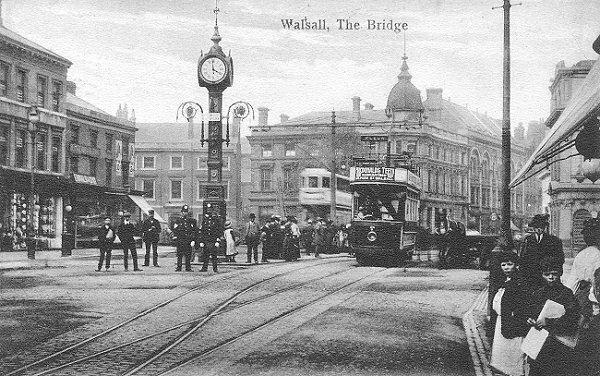 Steam trams began running in Walsall in 1884 under the terms of the Staffordshire Tramways Order of 1879. 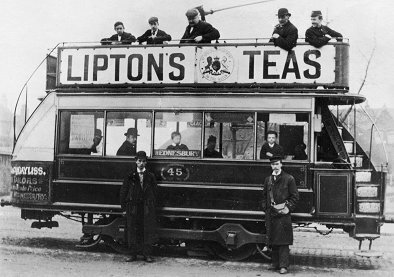 They were operated by the South Staffordshire and Birmingham District Steam Tramways Company, founded in 1882. 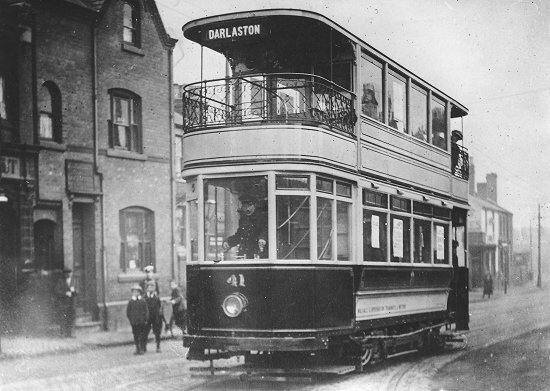 The company's headquarters and tram depot was in Corns Street, Darlaston. 12 built by the Starbuck Car and Wagon Co.
22 built by the Falcon Engine & Car Works. 16th July, 1883 New Inns Handsworth and Darlaston, via West Bromwich and Wednesbury. 14th January, 1884 Carter's Green West Bromwich to Great Bridge. 21st January, 1884 Wednesbury to Dudley, via Tipton. 21st January, 1884 Darlaston to Moxley. 4th December, 1884 Wednesbury to Bloxwich, via Pleck and Walsall. 4th December, 1884 Darlaston to Pleck. 4th December, 1884 Extension from Walsall to Mellish Road. 12th October, 1885 Great Bridge to Dudley. People greatly enjoyed the ease of travel offered by the first low-priced public transport system in the area. A large number of passengers were carried, and local railway passenger services suffered greatly. On 26th August, 1889 the company became the South Staffordshire Tramways Company, and soon began an electrification scheme. The installation was carried out entirely by the Electric Construction Corporation of Wolverhampton. The sub-contractor for the cars was the Lancaster Carriage and Wagon Company. Brown, Marshalls & Company produced three 150 hp. compound stationary engines for the generating station, which was built at Darlaston Road, Pleck, and designed by the Electric Construction Corporation's chief engineer, Thomas Parker. Coal was delivered by canal boats along the Walsall Branch of the canal into a basin alongside the building. The generating station consisted of an engine room, 59 by 45 feet, a boiler house 47 by 39 feet, with an octagonal 120 feet high chimney. The three Lancashire boilers worked at 120 psi. and were supplied by Messrs. Musgrave & Son, of Bolton. The three dynamos each produced 260 amps at 350 volts (91 kW). The traction motors were of the Elwell-Parker type. The posts for the overhead wire were placed at the side of the road, and the bracket arms carrying the trolley wire stretched out over the road from 7 to 10 feet, and gave a clear height of 21 feet. By a kind of universal joint, the collector was allowed a variation of several feet, so that the trolley wire didn't have to be directly over the middle of the track. The posts to carry the overhead wire were made by James Russell & Sons, and John Russell & Company. Walsall Corporation Tramways tram number 41 turns into Bescot Road, from Wednesbury Road, on its way to Darlaston via Wednesbury. 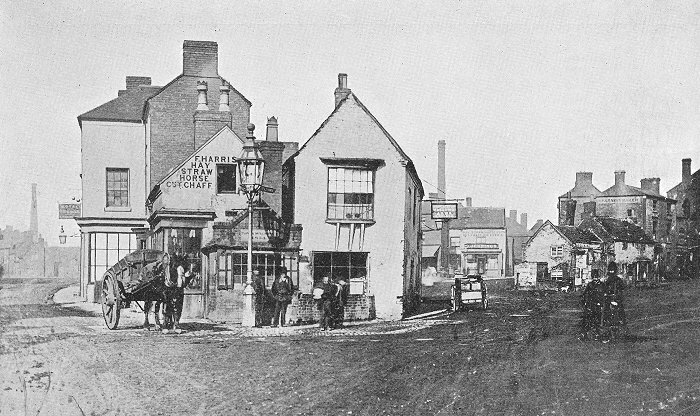 The building on the left, the Brown Lion pub is still much as it was in 1930 when the photograph was taken. On 1st January, 1893 the routes from Walsall to Bloxwich, and Darlaston to Mellish Road via Walsall had been electrified. The other routes soon followed and the steam trams were gradually phased out. In the first year of operation, the electric trams carried 1,668,057 passengers. The trams, in their oak brown and cream livery, were a familiar sight in the area. The South Staffordshire Tramways Company Limited ceased operating on 1st April, 1924. 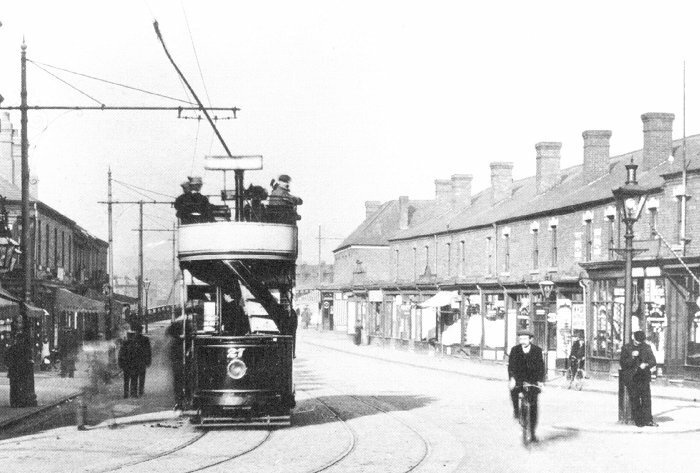 A Walsall tram at Pleck, on its way to town. From an old postcard. Walsall Corporation purchased the track within its boundary on 1st January, 1901 and leased it back until 31st December, 1903. Walsall Corporation Tramways then began running its own services on the Wednesbury and Darlaston routes. On 22nd July 1931 Walsall Corporation Transport began running its highly successful trolleybus network which survived for over thirty years. The last Walsall trolleybus ran on 3rd October 1970 by which time the bus services had become part of West Midlands Public Transport Executive who took over the Walsall fleet on 1st October, 1969. The Bridge. From an old postcard.